I keep eyeing this type of cookie when I’m at the grocery store. They are usually close to being fat free and come in so many flavours. The thing that stops me from buying them though is my husband. For some reason I only stop and look at these when my husband is with me and he always says “why would you buy those when you can make better ones?”. Usually this leads to me nodding, putting them back and forgetting about them. Well, this time I didn’t forget I broke down and made a batch. Meringue is not hard to make…as long as you have an electric beater. I can’t even begin to imagine what a pain these would be without one. Instead I stood there looking somewhat bored while I beat these, and pretended I worked really hard when I presented them for tasting. Which is totally win/win. I didn’t have a piping bag to make these look all pretty and professional but just pouring these out of a teaspoon made them look pretty in my opinion. Then again I like to claim rustic aesthetics whenever I can. This first step is optional. I like to take my 2/3 cup of sugar and blend it a bit in the blender to make it finer. I find it dissolves easier into the egg whites when the time comes. Beat the egg whites and cream of tartar until the eggs are foamy and thickened at high speed. Slowly add in the sugar, typically one or two tbl at a time into the eggs. Continue beating while adding at high speed until the mixture can hold stiff peaks. Use a rubber spatula to fold in the flavouring or any other add-ins (such as cocoa powder for chocolate meringues). Using a tsp or piping bag portion the mixture onto a baking sheet covered with parchment. 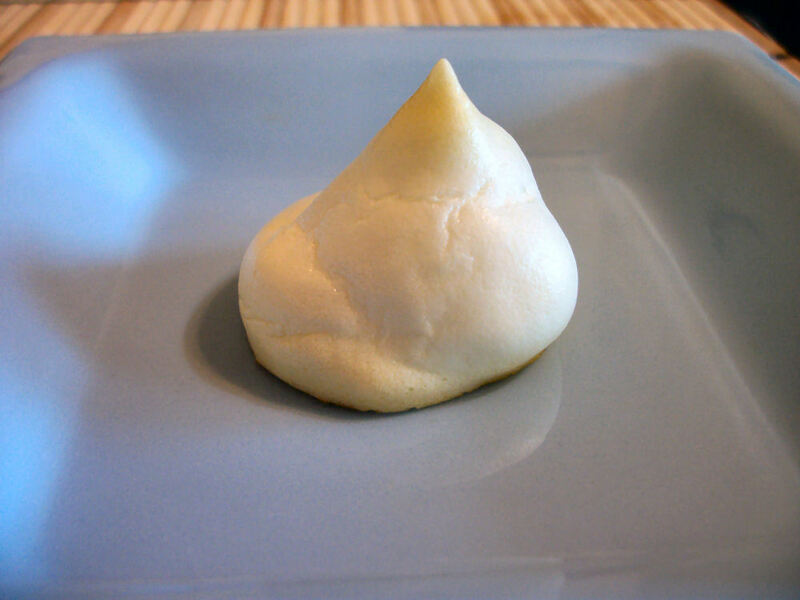 Keep the meringues about 1 inch apart with a volume of about 1 tsp worth. Bake at 275F for 35 minutes. They are done when they are firm to the touch and dry. Cool for 5 minutes and then remove from the baking sheet to cool completely. Makes 24 cookies. Each cookie contains 23 calories, zero fat, and zero fibre. Don’t serve these outside on a windy day, they are so light they might fly away…no kidding. These are a great sweet treat without the naughty, have fun playing with those flavour combinations. This entry was posted in Craving Buster, Dessert and tagged Egg, vegetarian. Bookmark the permalink.